Our lives have become increasingly visual. Nowhere is this reflected better than online. Where we once expected to only see text, we now are bombarded by images. Well they say a picture is worth a thousand words, but can a picture be worth a thousand page views? Surprisingly, the answer can often be yes. One of the little secrets of SEO is that it is FAR easier to rank highly for an image than it is for a website. In fact, a properly optimized image can rank #1 for keywords so competitive, that you wouldn’t dare think of targeting them normally. Let’s take the term “auto accident”. While many of your firms rank high for terms such as “your city auto accident attorney/lawyer”, how many of you thought you could rank that highly for just “auto accident”? Our lives have become increasingly visual. Nowhere is this reflected better than online. Where we once expected to only see text, we now are bombarded by images. Well, they say a picture is worth a thousand words, but can a picture be worth a thousand page views? Surprisingly, the answer can often be yes. One of the little secrets of SEO is that it is FAR easier to rank highly for an image than it is for a website. In fact, a properly optimized image can rank #1 for keywords so competitive that you wouldn’t dare think of targeting them normally. 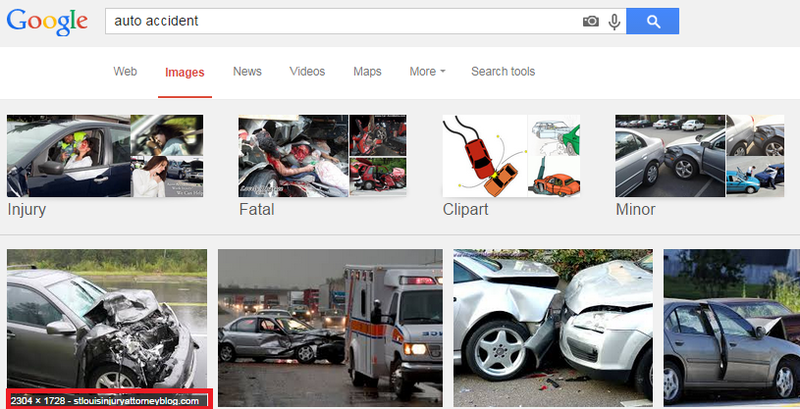 If you look above, you will notice that an image hosted on an attorney’s site ranks #1 for the term “auto accident.” And if you repeat this search yourself, you will notice that almost every image on that first page is from a business’s website. Not convinced? 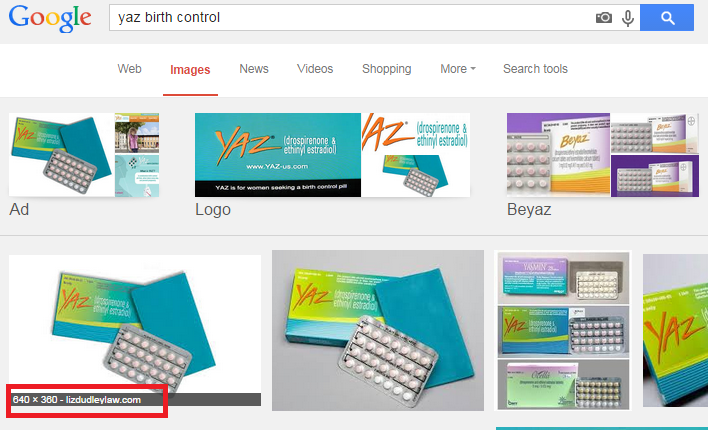 Let’s try a Google Images search for the birth control drug, Yaz. Now do I have your attention? But how were theses law firms able to get these images to rank so highly you ask? Let me show you. As explained in Michael Gray’s excellent blog post on the subject, having an image rank high comes down to four critical factors. Choosing a proper filename is pretty self-explanatory. You just name it what it is. You will notice that in the first example, the image is simply titled “Auto_Accident.jpeg”. It is best to separate words using either an underscore “_” or a hyphen “-“. In my experience, hyphens typically deliver better results than underscores. You might notice that Yaz image contains the image dimensions in the filename. This is not necessary to do. In fact, the only time you want numbers to appear in your filename is if you plan on having multiple similar on your site. In that case, you can either use the image dimensions, or simply number them “1,” “2, etc. The second part of the filename is the extension. Only upload images that are “jpg” or “gif” files, as these typically get the highest rankings in Google Images search. An image’s ALT Text is the text that is to be shown when the image itself cannot be rendered, and is now primarily for the screen readers that visually impaired people use to get an understanding of the image they cannot see. While an image’s ALT Text is a great opportunity to incorporate keywords for search engines to pick up on, try and remember WHO really uses ALT Text, and keep them readable and accurate. So while “New Orleans Auto Accident Attorney Car Wreck” is not an appropriate ALT Text for an image of a car accident, “Auto Accident In New Orleans” is. You can place extra emphasis on a particular keyword by creating a bolded heading of the keyword above the image. Creating a caption for the image containing the keyword is another way to connect the dots from keyword to image for the search engines. We recommend keeping your images between 100 x 100 pixels to 1200 x 1200 pixels. And if you need more examples of properly optimized images, take a look at the very images in this post. After all, how could we expect you to listen to us if we don’t practice what we preach?